Mark your calendars for Saturday, November 10th. 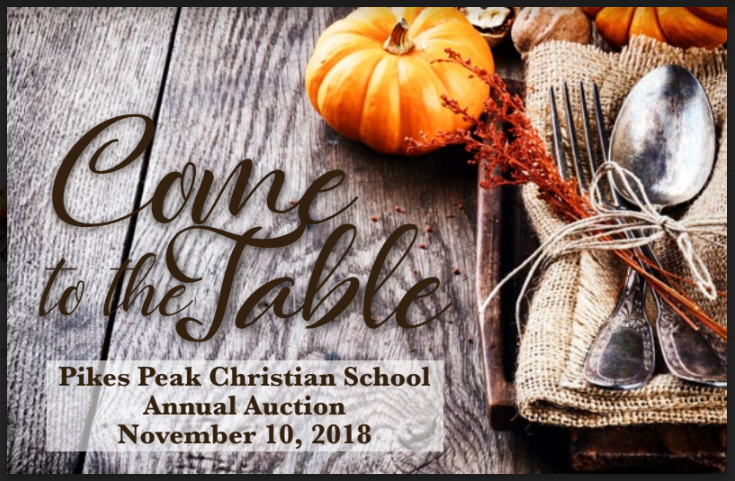 Get ready for the holiday season by attending Pikes Peak Christian School’s Annual Benefit Dinner and Auction. Enjoy a great meal, a live and silent auction where you can bid on unique gifts to benefit PPCS students. Dinner reservations will begin in early October. Donated auction items are being accepted at the school main office. Contact Kim Sanders, 719-598-8610, ksanders@ppcseagles.org. PLEASE NOTE: All items donated to PPCS Auction including class projects are the property of PPCS and are available ONLY at the PPCS Auction. Any reproduction of items will be at the discretion of and for the benefit of Pikes Peak Christian School.